Pete Key Holder. 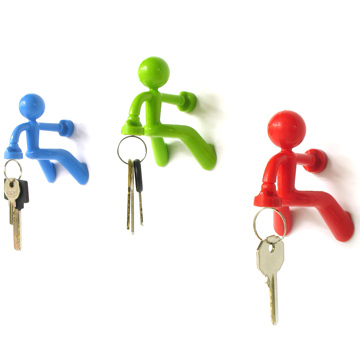 Original hang-key-storing keys or magnetic, very friendly is Pete, and have enough strength to hold all the keys you have is difficult. Pete puts on any metallic surface and see how many keys can support. Up to 20 keys can load this gentleman, thanks to powerful magnets. Besides Pete, is very cute and always looks good wherever you place it. Pete key holder measures: 8.1 x 7.5 x 6 cm.